We welcome guests with locos or traction engines or stationary engines on our Public Running Days, which are the 2nd Sunday of every month (see Timetables for dates). But please note that we have a limited capacity for freight trains on Public days - if you are not pulling passengers please check with us beforehand. 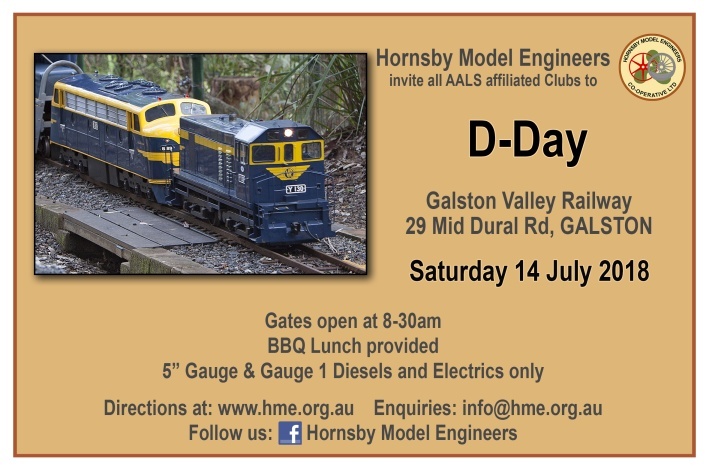 Every year we run a Diesel Day for Diesel & electric outline locomotives only. This is a relaxed inter-club running day, with plenty of opportunities to compare notes and chat. Lunch and morning and afternoon tea are provided. Members of other AALS affiliated clubs are welcome. Our Gauge 1 track will also be available for battery-powered diesel outline locomotives. Our next Diesel Day will be on Saturday 14th July 2018, 8:30 am onwards. A BBQ lunch will be provided. Please note our track rules, and in particular that we maintain a minimum age of 7 years for operators (persons 7-17 years inclusive must be under the direct supervision of a competent adult at all times). Sorry - no public admission on D-Day. 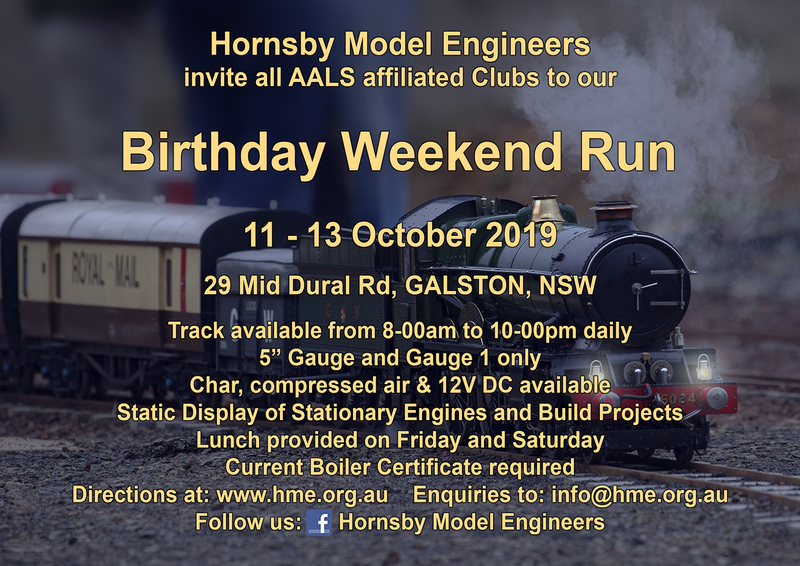 All visiting model engineers are welcome to our traditional October Birthday Weekend, 12-14 October 2018. Limited facilities for camping and cooking exist. If you need local motel or caravan park accomodation, please contact us for advice.